TeamDev Blog: JxBrowser 5 is Released! 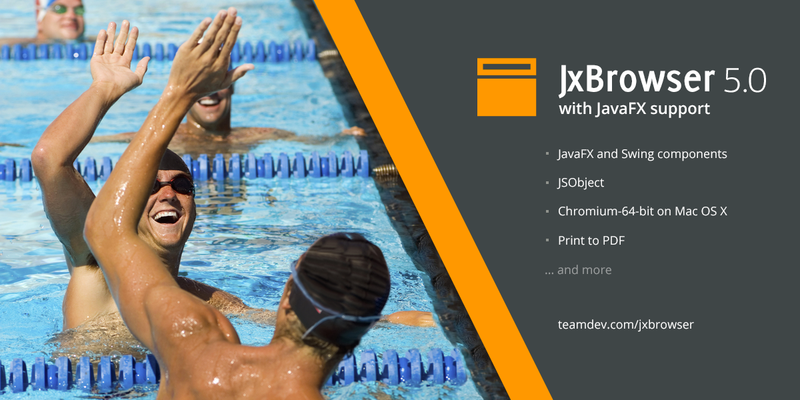 We are happy to announce the general availability of JxBrowser 5, the new major version of the most powerful and advanced Java library that allows embedding lightweight Chromium-based Swing/JavaFX component into Java applications. See the full list of changes in 5.0 on the JxBrowser 5.0 Release Notes page. The update is available for download. As usual, there are a number of samples available on our support site to help you kick-off work with our library. We would be glad to hear your feedback or provide help with use of our product on JxBrowser support forum.